Clint Eastwood isn't exactly the first name that comes to mind when thinking of Broadway musicals. Yet just two days after reading a screenplay for "Jersey Boys," the award-winning actor and filmmaker agreed to direct the musical, bringing the megahit stage production about Frankie Valli and the Four Seasons to the big screen. The film, which opens today, follows the group from their inauspicious beginnings in 1951, singing under lampposts in working class Belleville, New Jersey, to their induction into the Rock and Roll Hall of Fame in 1990. Along the way, they sing hit after hit as their fraternal bond is tested by the pressures of fame, booze and ego. Those hits -- "Sherry," "Big Girls Don't Cry," "Walk Like a Man," "My Eyes Adored You," and more -- energize the film as they did the stage production. Eastwood even has his singers perform the songs live on camera (rather than pre-taping), for a slightly ragged, more realistic rock sound. "Clint is a musician -- he's a good pianist, loves Jazz," says Marshall Brickman, who co-wrote (with Rick Elice) the book to the stage musical and the screenplay. "I can see when I watch the movie that there's a guy with a good ear behind the camera." For fans of the original stage version, there's much here that'll feel familiar. The story has not been wildly re-imagined, just "deepened," says Brickman, and they've kept certain devices -- like talking directly to the audience. As with the Broadway version, the film relies on the talents of four relative unknowns, most plucked from the casts of various "Jersey Boys" productions. 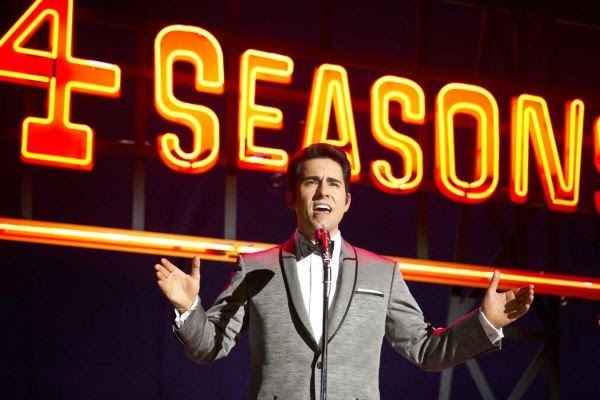 John Lloyd Young, who originated the role of Valli in the Broadway run (winning a Tony), stars alongside "Gossip Girl's" Erich Bergen (who played songwriter Bob Gaudio in the Vegas company) and Michael Lomenda (bass guitarist Nick Massi in the San Francisco production). Vincent Piazza is the newbie (best known as gangster Lucky Luciano on HBO's "Boardwalk Empire"), here taking on the role of street-savvy, self-destructing guitarist Tommy DeVito. Have you seen "Jersey Boys?" Tell us what you think of the film version below!